You will receive the exact item that is pictured. Jenson Button was the actual winner. These are RARE! SEE PHOTOS. Red Bull Racing Renault RB7. 1:43 Scale Diecast Car, 4" Long. 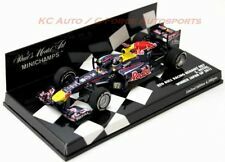 Formula One Diecast Car. Limited Edition of 4,248 pcs. This realistic diecast replica is a limted edition model of 1,008 pieces worldwide. 1:43 Scale Diecast Car, 4" Long. Formula One Diecast Car. The showcars differ from the 2011 race cars in that they are the previous season's shape finished in the team's new livery. Heikki Kovalainen. Limited edition 1,500 pieces worldwide. 2008 Showcar. Porsche 917K Kurzheck-Coupe. 1970 24hr Le Mans Winner. From the Le Mans History Series, Complete with Booklet. #23 Herrmann/Attwood. Shelfwear on box. 1970 McLaren M8D. 1970 Can-Am Series, Gulf #5. Other models available. 1970 McLaren M8D. Peter Gethin. 1970 Can-Am Series, Gulf #7. Other models available. Martin Brundle 1994 McLaren MP4/9 Peugeot #8. Car condition: Mint, as pictured. Dust-free, never displayed. Box condition: Display case has minor scuffing, as shown. Inlay is perfect. For sale is a very nice Action model as described in the title. The packaging may have some shelf/ storage wear. Please take a look at the pics for more information. PORSCHE DEALER LIMITED EDITION #0976/1000 NEW IN BOX. 1:43 SCALE - RED - BLACK INTERIOR - TOP DOWN. MOUNTED ON BASE - WITH CLEAR COVER. 1967 CHAPARRAL 2F. THIS IS A GREAT ADDITION TO ANY CHAPARRAL RACING COLLECTION. DRIVERS: PHIL HILL & MIKE SPENCE. AS RACED AT THE 1967 24 HR LE MANS. THE CHAPARRALS WERE THE FIRST TO USE THE HIGH ADJUSTABLE REAR SPOILER, IN 1967 2 CARS WAR ENTERED BOTH CARS DIDN'T MAKE IT TO THE END BUT THEY WERE IN THE RUNNING. Porsche 911 GT1. #01, Schumacher/Holtom/Brenner/Bytzek. LIMITED PRODUCTION OF 1,008 PCS. Porsche 934. Other models available. GTS Class WINNER 2001 ALMS "Petit Le Mans". Chevrolet Corvette C5-R GTS. 9/11 Tribute. 1:43 Minichamps, Chevrolet Corvette C5R GTS, Sebring 12h 2003 GTS Class WINNERS! Chevrolet Corvette C5R GTS. Sebring 12h 2003 GTS Class WINNERS. Other models available. Porsche 917K Kurzheck-Coupe. Team Porsche Salzburg. Other models available. Incredible Detail! Mint Condition! McLaren F1 GTR, Gulf Racing #16. Nürburgring 4 Hours 1995 4th Place. Car condition: Mint, as pictured. Dust-free, never displayed. 1:43 SCALE - YELLOW - BLACK INTERIOR. NEW IN ORIGINAL BOX - NEVER ON DISPLAY. Porsche 911 GT3 RS. Other models available. R alf Schumacher. German vice champion. 1:43 SCALE - BLACK - TAN INTERIOR - TOP DOWN. MOUNTED ON BASE - WITH CLEAR COVER. 911 CARRERA NEW IN BOX. #12, Interserie Champion 1970. Porsche 917K Kurzheck-Coupe. J. Neuhaus. Other models available. Maserati Tipo 61 Birdcage. SCCA National Race. Winner: #6 Roger Penske. I do hope that you understand. The Model is Factory Sealed, NEW, and has never been displayed, or out of it's box. Porsche 917K Kurzheck-Coupe. #59, David Piper. Other models available. Serial # 1465 of 4,444. This diecast Leader Cards Racing #23 Lola T 93 Ford powered PPG Indycar was driven by Buddy Lazier. This model was a limited edition run of 4,444 pieces. The clear case is cracked as pictured but the model and everything else is in perfect condition.